December '96: I found out through a very reliable source that John Waters is actually an ordained priest of the Universal Life Church. I'd tell you more, but it would violate the confidentiality of my source. Sorry! October '96: The most recent news I have about John is that he appeared as a guest on drag-star RuPaul's new talk show which airs on VH1. Miss RuPaul's other guests of that evening included Fred Schneider and the divine Deborah Harry. They discussed what they thought was camp and John of course stole the show. He brought out a supposed receipt for serial killer Jeffrey Dahmer's refridgerator in which would have been stored the remains of Dahmer's victims. Mr. Waters claims this receipt was anonymously faxed to him. He mentioned that his favorite periodical is Jet magazine which he implied he reads only to see pictures of Aretha Franklin's latest gowns. Here's some news I stole from the well-informed Matt Fagan whose 'Dreamland' site is linked below. "Pat Moran's husband, Steve Yeager, is putting together a documentary called Divine Trash: The Making of John Waters' Pink Flamingos. A "Petite Trasho Production", the film will feature the 1972 'Making of Pink Flamingos' footage, clips, interviews with some of the directors whom Waters claims to be influenced by, as well as Hollywood admirers of his unique place in cinema history." The premiere is supposedly in Baltimore, although a date was not specified. Waters was garnering press for his upcoming production in the Fall of '95. Shamefully, I missed his appearance on the Tonight Show, but heard he told Jay Leno that his new film tells the story of a movie superstar who is kidnapped by a B-movie director, forcing her, against her will, to appear in one of his productions. The working title of Water's film is Cecil B. Demented. 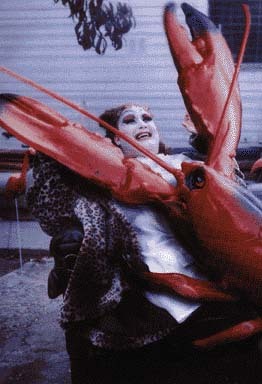 The December 1995 issue of Attitude, a gay magazine from the UK, featured a fashion spread inspired by the work of John Waters called Troubled Waters. Photographs by Markus Morianz and styling by Gitte Meldgaard. The shoot includes clothes by Hamnett, Versace, Westwood, D&G and many other labels that would never be seen on the backs of Dreamland characters. Drag superstar Jackie Beat (in photo above) models as Divine in scenes inspired by Pink Flamingos and Female Trouble. There's even an homage to Polyester's footstomping fetishist. There's also a recent exhibit of John Waters' photography serials titled "My Little Movies" described in a HotWired article. DreamlandNews © 1995 Jeff Jackson.